Tipasa is a product of the Punic and Roman civilizations. 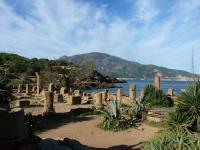 It was founded by the Phoenicians as a Carthaginian trading centre. They left behind one of the most extensive cemeteries the Phoenician world. Then it was made a Roman military colony by the emperor Claudius, and afterwards became a municipium. The Roman city was built on three small hills which overlooked the sea. Of the houses, most of which stood on the central hill, no traces remain; but there are ruins of three churches - the Great Basilica and the Basilica Alexander on the western hill, and the Basilica of St Salsa on the eastern hill, two cemeteries, the baths, theatre, amphitheatre and nymphaeum. The North coast of Africa is well represented on the List with Roman ruins so, do those of Tipasa add anything? Well it has the normal range of buildings to be found in a Roman town – a theatre and amphitheatre, temples, a Cardo Maximus, villas, baths, nymphaeum etc etc. What perhaps sets Tipasa apart is its location on a couple of promontories in wooded countryside next to the Mediterranean. I make no claim of sympathy with (let alone total understanding of!!) Camus’s philosophy, nor to having any similar profound experience whilst there – but the site is certainly very pleasant to wander around and even, perhaps, to ruminate as he did on the absurdity of existence!! At the far western point of the site on the promontory beyond the Necropolis stands a stelum erected in his memory with the “Je comprends ici…” quote inscribed upon it together with the name of Camus. The name has been partially erased/reinscribed. We were told that it had been erected by French people and that, as a “Pied Noir”, Camus’s status within Algeria is still controversial – which possibly explains the attack on his name. Another significant aspect of the site is the presence of a number of Christian ruins and cemeteries from the 3rd and 4th Centuries – in fact it has had 4 Basilicas. Two of these - The Great Basilica, with no less than 7 naves and Basilica Alexander are situated on the Western Promontory, where the main Roman ruins are situated. 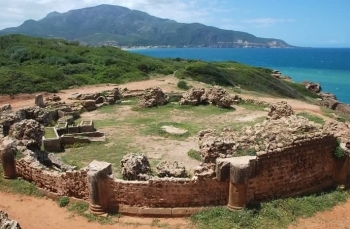 The ruins of those of St Salsa and SS Peter & Paul are on the other side of the modern town of Tipasa on the Eastern Promontory and we didn’t go there. St Salsa was Tipasa’s very own 4th Century martyr! The visible remains of the site are, as far as I could see, all late Roman, though its history extends back as a Punic port to 6C BC. As part of Western Numidia, its local kings assisted Rome in the 2nd Punic war but later incurred Rome’s hostility and the area eventually became a formal Roman province in 46BC under a local King appointed by Rome. The town reached its peak as a trading centre in the 2nd C AD, became at least significantly Christian from the 3rd C but was conquered by the Vandals in the 5th C and was briefly under Byzantium in the 6th C before being conquered by the Arabs – when apparently it was already largely abandoned. There is a fine series of books published in French on Algeria’s Roman sites – including that of Tipasa (ISBN 978-9947-979-12-9). In my opinion these are well worth having (each is 600 dinars = approx €4 at “unofficial” rates), particularly as they include photos of the mosaics in the Museum where no photography is allowed. Parts of the “set” are on sale at each site but bear in mind that they are almost certainly out of stock at the site to which they refer!! If you are visiting more of Algeria’s Roman WHS pick up the relevant books for whatever you intend visiting wherever you can. We visited the mausoleum on the way back to Algiers from Tipasa (the journey there along back-roads can be quite slow as the motorway doesn’t have an exit despite going very close, but the visit itself won’t take much over 30 minutes). It is set on a high hill and consists of a circular stone-faced mound with vertical sides and a conical top. It stands 32m in height and 61m in diameter and commands a superb view - even visible from parts of the Tipasa site. It contains a tomb chamber which is situated right in the centre reached by a decreasing circular passage from an entrance portal. This latter is visible but the passageway and tomb cannot be visited. The mausoleum’s history is somewhat unclear. The title “Tombeau de la Chretienne” derives rather fancifully from the fact that there are 4 large vertical slabs forming false doors around the side of the tomb on which are carved a symbol which could be a Christian cross. Until recently most reports have stated that it is the Tomb of King Juba II (52BC – 23AD) and his wife Cleopatra Selena – daughter of the “famous” Cleopatra of Egypt! Juba II was a loyal ally of the Romans and fought for them in Greece and Spain – lovers of trivia might like to know that, according to Pliny, it was he who named the Canary Islands!! However no remains from this period have ever been found in situ and opinion now seems to place this sort of tomb rather earlier – see my review of the Mauritanean Tombs T List site. When I was a kid we lived in Algiers, and used to go out to Tipasa fairly often at the weekends. I remember very clearly wandering around the site - it's incredibly beautiful, right by the sea, and somehow timeless. The memories have stayed with me always, and the place holds s pecial meaning for me now. I'd love to return and someday, hopefully, I will. Built in the 6th century BC: Criterion (iv): "the contacts between the indigenous civilizations and the Punic and Roman waves of colonization between the 6th century B.C. and the 6th century A.D"
Works by Nobel Prize winning authors: "Noces a Tipasa" (1938) from the collection "Noces" and "Retour a Tipasa" (1952) from the collection "Ete" - Essays by Albert Camus. The site contains a commemorative stone with a quotation and his name partly erased (he was a pied noir). 27 Community Members have visited.